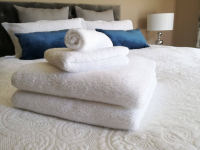 Conach House Bed and Breakfast is the ideal retreat to base your clients while they enjoy beautiful Cambridge and all the great attractions within a short drive. Guests have the choice of three generous, well appointed rooms. Each room is fully self contained with private entry and off street parking. A delicious continental breakfast is included. Rooms have their own small porch and guests are welcome to enjoy the beautiful grounds, spa pool, fire pit and BBQ area. Located directly opposite Lake Karapiro and the Te Awa cycleway means there is plenty to enjoy right on our doorstep. Day trips are a breeze with Hobbiton 25 minutes drive, Waitomo Caves 56 minutes and Rotorua 1 hour away. Original generation time 1.5179 seconds. Cache Loaded in: 0.0152 seconds.